This forested area is the final resting place of Knight Artorias; his grave is guarded by Sif, the Great Grey Wolf. It is also the stomping grounds of the Forest Hunters covenant. There also lives here the Moonlight Butterfly, a creation of Seath the Scaleless. 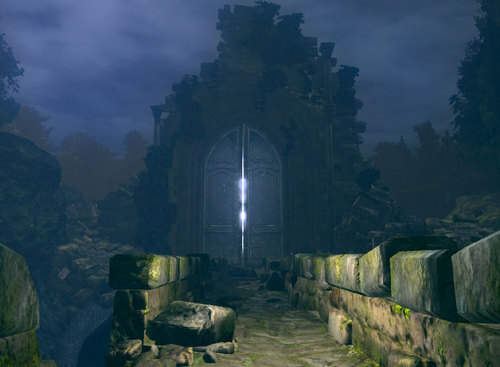 The forest of Darkroot Garden is considered sacred land and much of it lies behind a sealed door that only the Crest of Artorias can open, attained from Andre in the nearby Undead Parish. The garden is protected by Alvina and her Forest Hunters. The Forest Hunters will attack any who disturb the forest or the solemn graves contained within. Darkroot Garden is home to many exotic creatures, as well as ancient automatons called the stone giants. This area is also possibly the ruins of Oolacile. With such dangers, the crest can do more harm than good in the hands of the uninitiated.